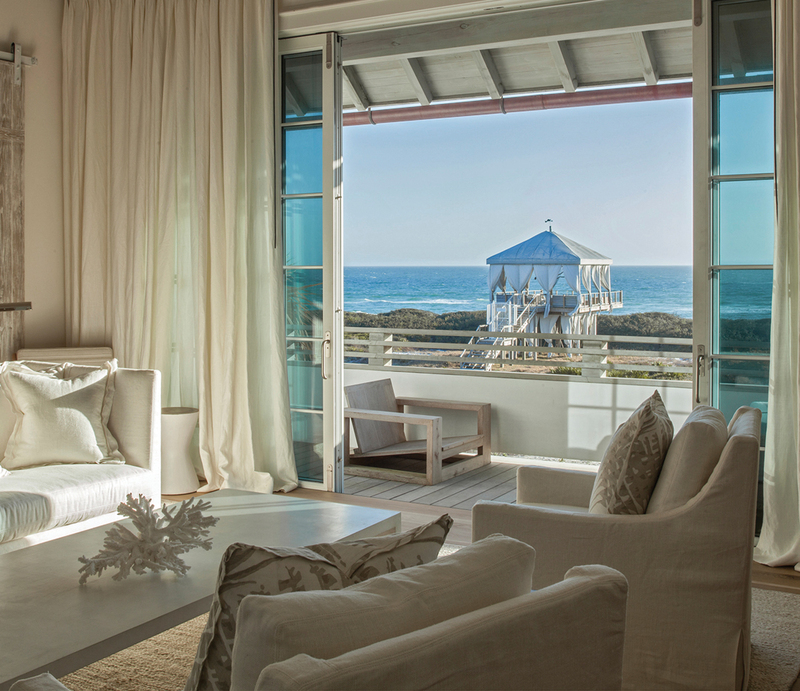 At Alys Beach, every design decision begins with the view. Both floorplans and furniture selections aim to maximize the vista beyond the windows. Whitewashed architecture, understated landscaping, and a turquoise ocean have become the hallmarks of this upscale Florida Panhandle community. At this vacation house for an Atlanta family, architect Julia Sanford (herself an Atlanta native and Georgia Tech graduate) located the living areas on the second floor to provide better views of the ocean. She also created a roof deck and an outdoor room by the pool—al fresco nooks that the homeowners love to use for entertaining. “When the house is full, there are 17 of us there, but it doesn’t feel crowded because Julia was able to carve out these other areas,” says the homeowner. This vacation home has more than 4,000 square feet of air-conditioned space, plus almost half that much in outdoor rooms. 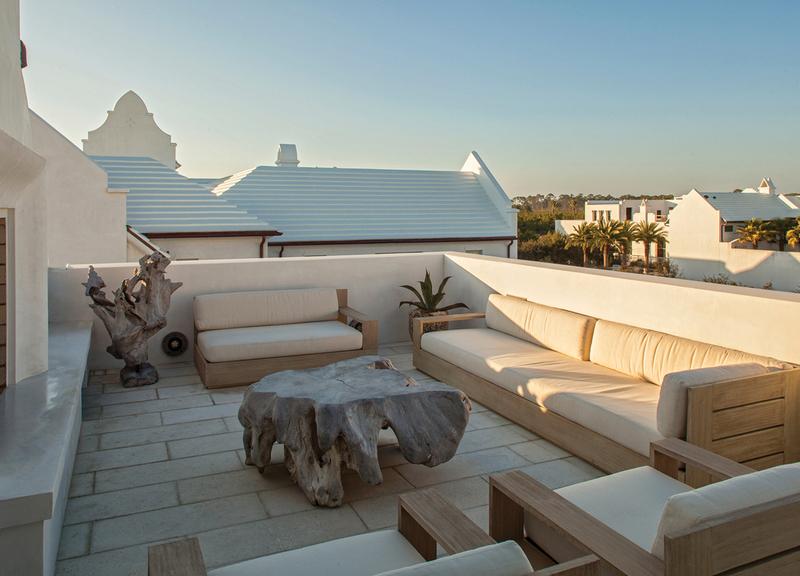 A signature look at Alys Beach is the white roof, a tradition in Bermuda for catching rainwater, says architect Julia Sanford. 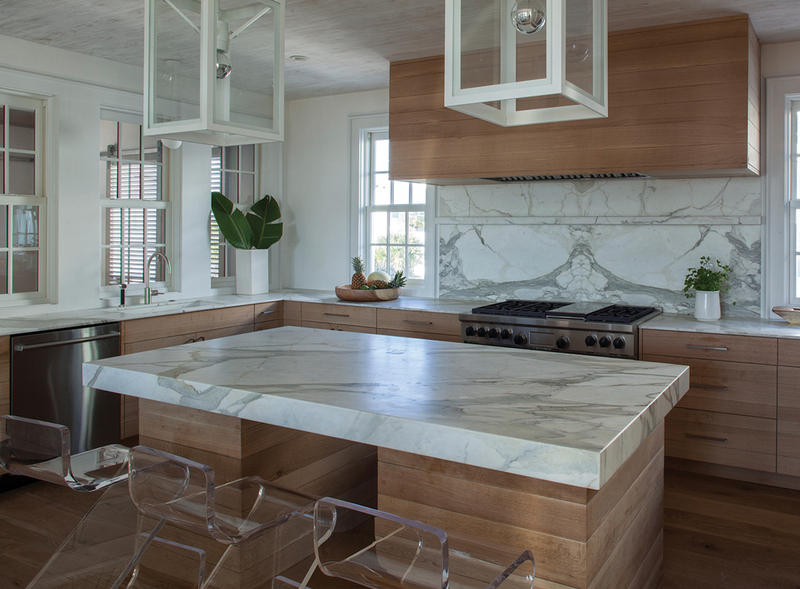 Sanford was part of the original design team at Alys Beach, so she “gets” the concept. 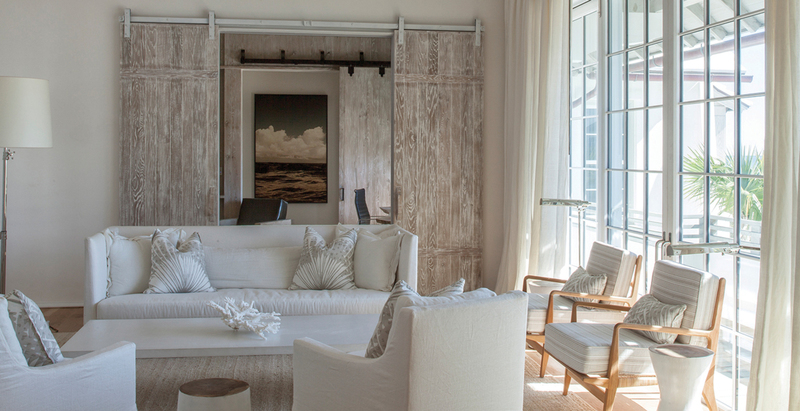 “Alys Beach design is restrained and classically beautiful,” she says. “It’s a minimalism that allows buildings to work together rather than compete with each other.” Visitors often compare the community to Bermuda because of the white-tile roofs and masonry exteriors, Sanford adds, or to Greek towns because of the restrained palette. White oak floors and slipcovered linen furniture are recurring motifs throughout the house, but Sanford took neutral design to a higher level with some special features: pecky cypress paneling in the sitting room, hand-painted cement tiles in the summer kitchen, and lime-washed oak cabinets in the main kitchen. A book-matched marble backsplash and lime-washed oak cabinets define the stunning—but subdued—kitchen. Custom Lucite barstools add sculptural interest. Oversized light fixtures from the Urban Electric Co. provide geometric simplicity. A custom suede sofa by Verellen was ordered taller than normal to appear proportional with the 14-foot ceilings in the sitting room. The homeowners enjoy hosting college friends and their families every year, which led to their request for four bedrooms that each accommodate a king-sized bed. “Each bedroom is compact, but has sufficient storage,” the wife says. Guests tend to gather in the common areas: the media room for sports and movies, the third-floor porch for Fourth of July fireworks, and the spacious living room with its view of the sparkling Gulf. A rooftop deck, above, includes a fireplace for year-round enjoyment. A concrete dining table and lightweight chairs fill this dining space. Practical white concrete pavers serve as flooring. 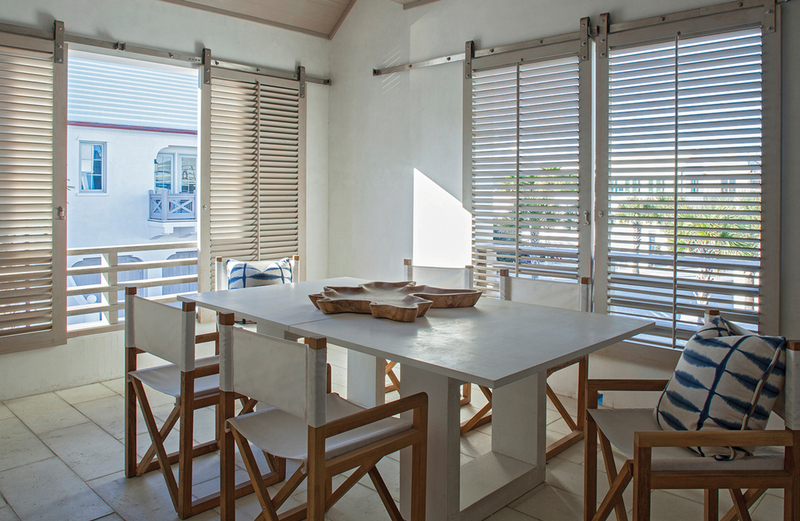 Louvered shutters can be opened or closed depending on the weather. 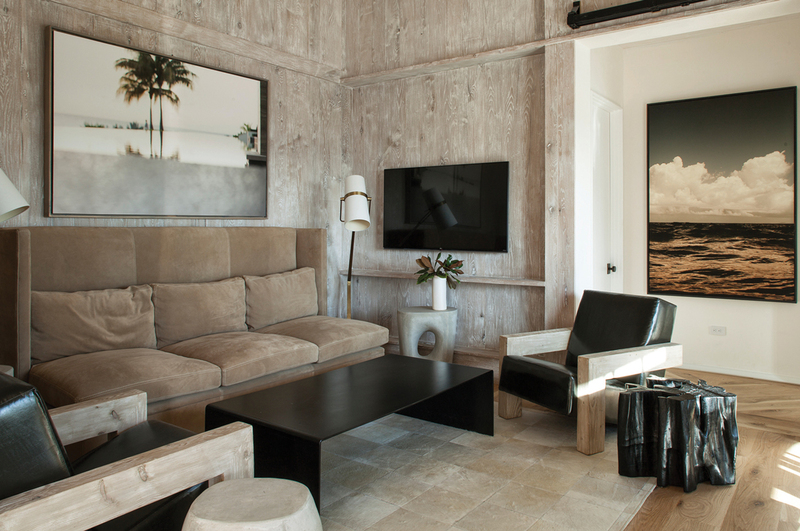 History Continuing the success of neighboring Panhandle communities such as Rosemary Beach and Seaside, the Miami-based urban planning firm Duany Plater-Zyberk created this 158-acre, environmentally friendly beachside development in 2004. Inspiration The residences evoke all sorts of cultural influences. All homes have private courtyards, such as those found on islands like Antigua. The stucco masonry and white-tiled roofs call to mind Bermuda, while Mediterranean touches are reminiscent of European cities. 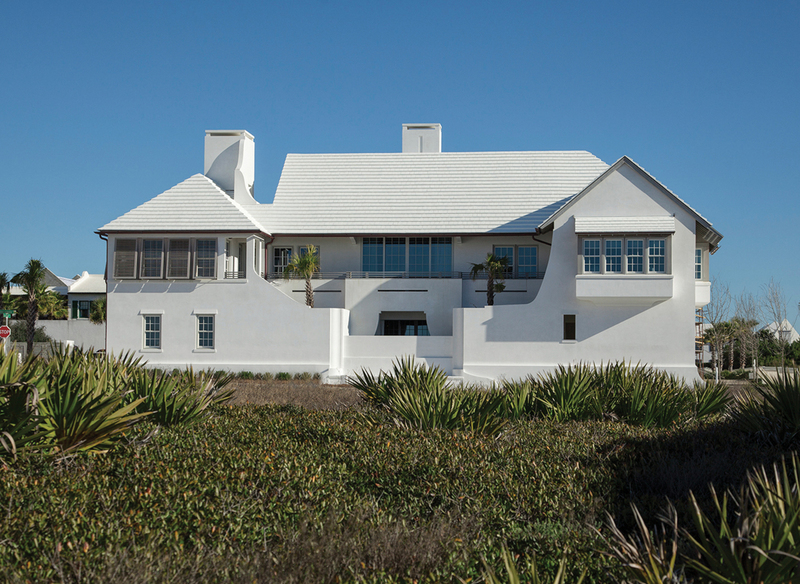 Unlike other beach communities where each house has its own architectural point of view, the all-white philosophy gives this little town a unified identity. Price range Homebuyers can purchase their own lot (starting at $409,000 and surpassing $1 million) and work with the in-house construction team on a custom design, or choose a spec house. Prices run from $1.5 million to $3 million-plus. Amenities The swanky Caliza restaurant is situated poolside and serves up local seafood and artsy cocktails. A fun start to the day involves a trip to Charlie’s Donut Truck—located in an old Sunbeam bread truck. Fonville Press is the town’s coffee shop, newsstand, and wine bar. This article originally appeared in our Winter 2016 issue of Atlanta Magazine’s HOME.